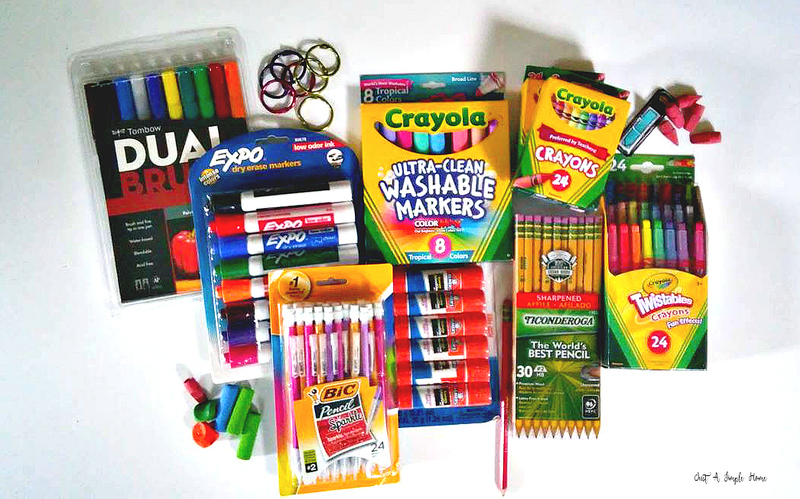 There are always a whole bunch of back-to-school supply checklists. What about homeschoolers? Do you have a homeschool supply checklist? Today I am going to share with you some of our favorites that make our homeschool life easier. I also have a little checklist of supplies that I stock up on each year at back-to-school time. Some of these are bigger ticket items that we may have had for years, but we literally use them almost daily. Here is our list of the supplies that we use regularly. You’ll find the whole list at the end of this post for your reference. Links below are Amazon affiliate links, I do receive a small compensation if you purchase products from these links. So thank you for helping to support my blog! Pencils (I usually get Ticonderoga No. 2 pencils. After many years of homeschooling, I have found these are the best pencils ever – they don’t break, the lead just seems to work better than most). Binder Rings (We have used these for numerous things, always good to have on hand). Index Cards and Box (Used for many things, like vocab or math, verse memorization, games etc.). Wall Map (I recommend getting a quality wall map, it will last you for years. We have a US map and a World map). Globe (We have used this globe for years and they still love it. You could get a plain globe, but I love that this one has so many educational games and activities). Mini Dry Erase Boards for each child (I do have one large board for the room, but each child likes to have a smaller one for their work). Laminator: I still can’t believe how often I use my laminator. It gets very frequent use, especially at the beginning of our school year. You could laminate at a local store if you prefer, but I have found the ease of having one at home is well worth it. This one is not expensive and has lasted us many years. I did purchase it online originally and now can pick up the refill packets at WalMart and Target. Printer and Ink (It will get a LOT of use, so get a decent one). Pencil Sharpener It is WELL worth buying a good one! (We use this one. We do have some cheap sharpeners as well, but an electric sharpener is an absolute must in our homeschool). Red Correcting Pencils ( I use Ticonderoga Checking Pencils to check work). White Board These can be pricey, but it is a necessity in our homeschool. It is literally used daily. I have a 3′ x 5′ size. Fun little things for our Prize Box (When the kids finish all their schoolwork for the week without complaining, they get to pick from the prize box). Desktop Carousel: We have changed this up over the years, but have always had one. There are quite a few to pick from. We have also made our own at times, with a cheap bucket type thing and glass jars inside to organize our supplies. I keep the majority of our supplies in here so everyone can share. 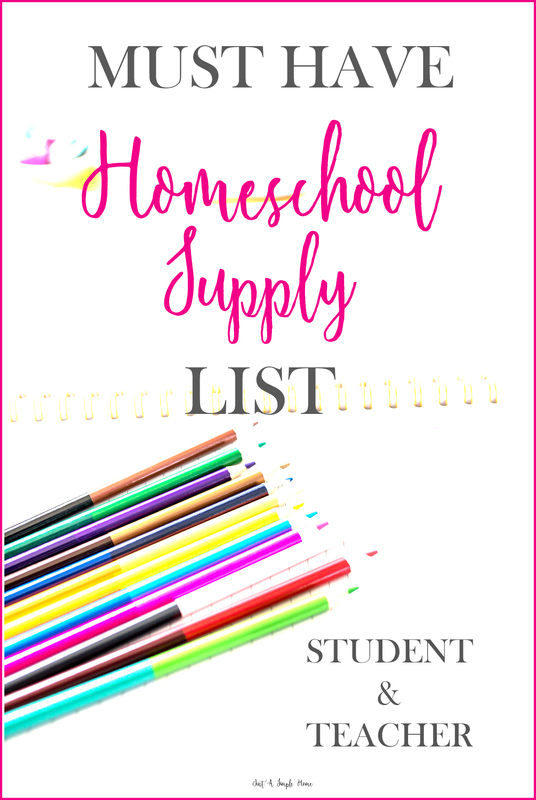 I think that about sums up our homeschool supply list! It seems like a lot, but some of these things we do not have to buy every year. You can find notebooks and folders on sale during the summer for just cents, and stock up! Same goes for crayons and markers and things like that. We do have some other items in our homeschool, but these are the things I consider must haves. Here is a quick reference list of the supplies I mentioned, for your ease. Let me know if you think I missed anything that you find to be a must in your homeschool! This is very helpful! As a homeschool mom sometimes I find myself going to the store throughout the school year buying here and there. I need to be more organized and buy at the beginning of the year. You have inspired me to be more organized about the matter. 🙂 Thank you! The small dry erase boards are my absolute favorite thing in our homeschool. I even have clear ones for my kids to work on their logic puzzles so they can do them more than once. I have also been using a lot of spiral notebooks in our homeschool. What a great idea! Thanks for putting together this list! I will have to Pin it so I can use it next month when I go homeschool supply shopping. Great list! I use most of these but not the laminator! Shocker huh? lol I think breaking it down for student and teacher is perfect. Thanks! We don’t start up again until September, I’ll pin it until then. Love this list, and love your blog, too. We are always seeming to be running out of dry erase markers!